She ran straight for almost a mile, not daring to glance back, afraid it would slow her down. The menacing yells eventually faded away, and she chanced glancing behind her, bracing herself for if one of them were there. She glanced back, and stopped dead in her tracks. She breathed a shaky sigh of relief and immediately slumped against the nearest tree, shaking from the sprint she’d just done; it was farther than she’d ever had to run in her life. Her breath came in ragged gasps and she held a tremulous paw to her madly beating heart, catching what little breath was left in her. Sweat drenched every inch of her body and had dampened her lovely blue fur, and dirt smudged her cheeks. Of course, she knew wishing would get her absolutely nothing. Wishes never came true. Dreams never came true. After a while she finally calmed down, and she gazed into the distance without seeing it. She stood to her feet, standing surprisingly tall, as if she hadn’t experienced any trauma. While she prepared to go back home, something curious caught her hazel eyes. But it was a strange colored light, unlike any color she’d seen before. In fact, it wasn’t merely one color, but several mixed in a rather intricate yet beautiful fashion. There was periwinkle blue, lavender, light jade, and steel gray, all mixed in one. The second she saw it, she knew: There’s definitely nothing normal about that light. Her curiosity getting the better of her, she altered her course and headed toward the light, the light drawing her in like a Lupe on a leash. Once she reached it, she noticed it was coming from a bush. A rather ordinary looking bush it was, with a plain, dark green color and a few spoiled berries. Nothing remarkable. Eagerly, Flayire pushed the leaves apart and looked to see what was causing the beautiful light, and her mouth dropped to the floor with awe. There, right in front of her, was the most amazing, remarkable, most exquisite crystal she’d ever seen. It seemed to be made of glass, shimmering and sparkling, power and beauty emanating from it, making everything around it look shabby and dull. It barely seemed to be there; it was so beautiful, so unreal... She was afraid it was an illusion, and would disappear before she could touch it. Slowly, cautiously, her heart racing, she reached out her paw and touched it. What happened next would be the most pivotal moment of her entire short, dangerous, dreadful life. And she wasn’t expecting it at all. She came to an abrupt halt, so sudden she fell to the floor, knocking the wind out of her. She groaned and tried not to vomit, clutching her stomach and feeling miserable, like she’d just been on the worst roller coaster of her life. After lying on the floor and wallowing in self pity for a few more moments, she sat upright with obvious reluctance, taking in her now completely and utterly different surroundings. The first thoughts that came to her head were: Posh. 110% posh. The carpet beneath her was cream colored and soft, but had wood underneath. Velvet curtains blocked out all the light in the room save for a small candle, its light flickering dully. She glanced around for a light switch, but didn’t see one. Okay, no electricity. Maybe not so posh. Or extremely old fashioned. Flayire continued her inspection. The bed was a four-poster and had a translucent sheet draped around it, which was parted slightly, as if someone had just emerged from inside it; from what she could see, the sheets inside gave off a velvety purple glow. A sharp knock on the door interrupted her thoughts, and she jumped, startled. “Y-yes? Come in,” she called, perturbed; Is this my room or something? Why are they knocking? A short, smartly dressed Royal Krawk came through the room, and she felt her jaw drop again. He was strikingly handsome, with a darkly tanned, muscled body, and spiked brown hair. His eyes were dark orange and slightly slanted, full of intelligence and wisdom, but also full of joy and happiness. He was clad in a fancy maroon robe with a fur lining, with a golden buckle with glittering rubies on front, and in his hands he held a staff taller than he was, the top of it sporting a rather impressive-looking ruby, much like the one on his buckle. Flayire felt immediately inferior; she was convinced she was still an ordinary, blue Aisha, neither plain nor beautiful, dressed in torn clothes and with dirt smudged on her cheeks. But the Krawk looked fondly at her, starry-eyed, as if he were gazing at something beautiful. “Why daughter, you look beautiful tonight,” he said earnestly. Flayire used all her self control to not demand what he was talking about. What’s going on?! I‘m not your daughter! You‘re not my father! she thought furiously. But she decided to play along. “You look rather dashing yourself, father,” she said, and the words felt even stupider as they came out, and she blushed furiously. Her “father” smiled, flashing a set of perfect, ultra white teeth. “Thank you. Dinner is served in five minutes downstairs. Don’t be late, we’re dining with King Skarl and Jeran tonight.” With another look at her, he turned on his heel and walked out the door, closing it gently behind him. The second he left, Flayire dashed to the nearest window and looked at her reflection. When she did, she practically jumped out of her skin. Instead of seeing the normal, blue Aisha she was used to seeing in the mirror, in front of her stood the epitome of exquisite, female royalty. She looked stunning. Her fur was silky and smooth, a soft tickle-me-pink, and perfectly-cut curls of flaming orange hair curled her now gorgeous face. She wasn’t wearing her normal clothes, either; she wore a dark purple dress, with long sleeves that dragged to the floor and light purple ruffles at the bottom, and on her head she wore a hat the same color as the dress, with a light lavender sheet draping elegantly from the top. She was literally a princess. Less than five minutes ago, she’d been some dirty blue Aisha running for her life through the woods of Neopia Central. Now she was standing in this posh, this unrealistic room, dressed in elegant clothing and looking more beautiful than she’d ever felt before. She closed her eyes hard and opened them again, but everything was as it was before. After a minute, she felt her stomach slip several notches as crushing reality dawned on her: This is real. With a sigh, she looked back in the mirror, staring at her bewitching reflection. She touched her hair. Her reflection touched her hair. She made a funny face. Her reflection made a funny face. Is that really me? Or is someone on the other side imitating my every move? But when she looked down, she could see the dress she was wearing. Ah, so my eyes do not deceive me. She decided to just play along with this. Maybe this was some sort of trick, an illusion. 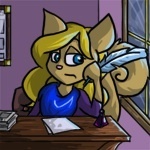 Pretty sure it’d been five minutes, she opened the door to her room and made her way down a grand hallway; the hallway was made of polished marble and the walls were lined with paintings of important-looking Neopets. Soon she found a staircase, and she walked down it rather gracefully, trying to play her role as much as possible. Distant laughter came from her right once she reached the bottom of the stairs, and she flushed, thinking they were laughing at her. But they weren’t. She followed the sound of their laughter and ended up at a surprisingly small table. At the table sat her “father,” Jeran, a strong-looking blue Lupe, and King Skarl, a fat but impressive looking blue Skeith, with a crown on his head. Once she was in view, they all stopped eating and stared at her. Jeran looked particularly star struck. Feeling awkward, she said, “Hello,” and sat down at the vacant seat, which happened to be next to King Skarl; she’d never had so many people stare positively at her at one time in her life before. Her eyes met Jeran’s, and she was startled by their golden yellow color; it was unlike anything she’d ever seen before. She felt her cheeks turn slightly pink again, embarrassed to have met his gaze. Her “father” cleared his throat. “Ah, Flayire. This is King Skarl, king of Meridell,” he said, waving his hand in the king’s direction. King Skarl shook her hand, a firm, strong grip, that made her feel like he was trying to yank her arm out of her socket. Unintentionally. “And this is Jeran, Meridell’s most famous knight,” he said, waving in Jeran’s direction Jeran smiled, a rather aw shucks smile, with perfect white teeth and obvious kindness. “It’s an honor to finally meet you, Princess Flayire,” he said, and there was something strange in his voice Flayire didn’t quite understand. Was it admiration? She’d never been admired in her life. Why start now? But she asked no questions. She merely smiled at both of them, rather shyly. “Pleasure to meet you both,” she said politely but shyly, looking down. That was all she really listened to for the rest of the dinner. Their conversation was distinct and sounded like buzzing. She focused on her roast pork and mashed potatoes with gravy, eating slowly, with painfully small bites, despite how much she wanted to gobble up the delicious food. It was perfect. Even the grape juice in front of her looked exquisite, in its golden goblet with grapes hanging limply from the side. When she heard a loud laugh, she snapped up from her gaze. The whole table was laughing at a joke in which she hadn’t heard. Her “father” was looking at her, as if he expected her to laugh. She did a nervous, little halfhearted laugh for him, and he chuckled. But Flayire didn’t listen to the rest of the conversation. She was thinking to herself. So, my “father’s” name is Alerzal. Handsome name. It sounds familiar. Not sure why. He must be some Meridellian upperclassman I read about in school. She tried to think more but eventually ended up giving up. After that, she tried to eat her delicious food again, but it stuck in her throat and she didn’t taste a thing. Eventually she just gave up, putting down her fork, with almost a full plate of food still on her plate. Everyone looked at her, concerned; they all had finished eating theirs. “Flayire, aren’t you hungry?” Alerzal asked kindly, not accusingly. Flayire shook her head. “No, Father,” she replied simply. If you ended up in some strange new place that you didn’t like just because you’d touched some dumb crystal, you’d lose your appetite too, I bet. Alerzal didn’t look convinced, though the rest of the table did. They all continued their chatter, but Alerzal was staring straight at her intently, trying to figure out what was wrong with her. Though Flayire looked down, she could feel his intense gaze on her face, and she determinedly didn’t look back at him. After a while, the guests grew tired and bid them farewell, thanking them for the dinner. Flayire watched them leave with tired eyes, and she saw Jeran wink at her. She flushed red immediately and looked down, unsure of why she was so determined not to look at him. Alerzal smiled at him. “Time for you to go to bed, daughter,” he said, his voice soft but full of authority. Flayire didn’t need to be told twice. “Yes, Father,” she said softly, turning and marching up to her room without a peep or argument. If she would have just looked at him, she would have noticed he was frowning. He had expected an “I love you,” and it never came. Once she reached her “room,” she jumped onto her bed, landing on her stomach. The tears she’d been holding in for all that time came out slowly and painfully, creeping down her cheeks and tickling her, like little Cobralls. She wiped them away, but new ones formed. The thoughts in her head were negative and unhelpful. Why am I here? This isn’t fair. I’m not royalty, I’m just Flayire. Just Flayire. I’m not special. I’m an ordinary blue Aisha and I don’t deserve any of this... This posh! What’s happened to my life? Her “father” entered the room, his face looking melancholy. It turned worse when he saw her tears. He strode over to her bed and sat down beside her, those jolly eyes full of sympathy and concern. Cautiously, he reached out a hand and wiped her tears away with a kind hand, his head tilted sideways a bit as he studied her. Flayire stared up into those chocolate eyes of his, her lip quivering as she searched her brain for the memory of how to speak; she was miserable. And she was being forced to tell this gorgeous Krawk who was supposed to be her father everything, when she barely knew him, barely knew if she could trust him. She sighed very deeply and began speaking, telling him everything.